This dish takes its name from the Korean word for mixing rice. 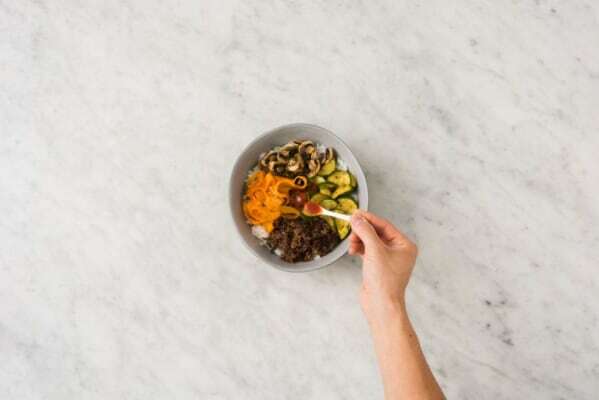 Which is exactly what you’re meant to do after serving it: put your rice in a bowl, add the toppings, and mix it all together so that those flavors and textures combine in a glorious mishmash. 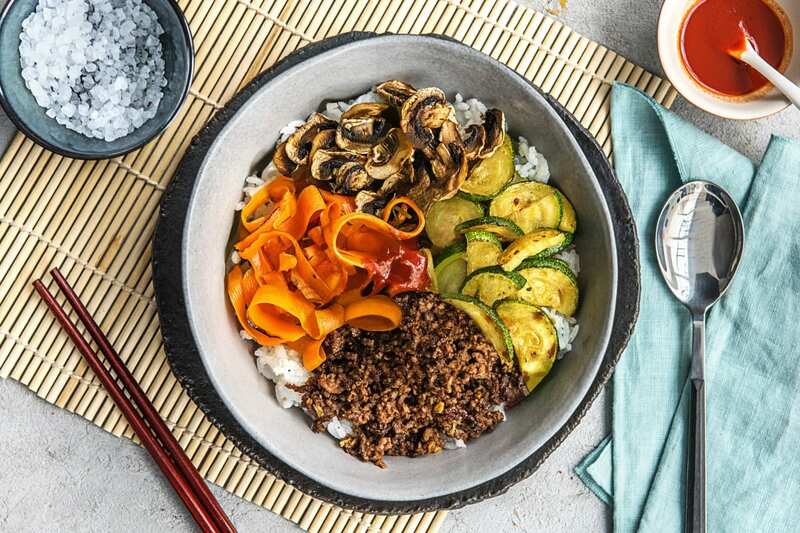 There are plenty of flavors and textures going on here, too, like sweet carrot, juicy zucchini, and beef tossed with garlic, ginger, and soy. Wash and dry all produce. Halve zucchini lengthwise; slice crosswise into thin half-moons. Trim and thinly slice mushrooms. Trim and thinly slice scallions, separating whites from greens. Peel carrots; using a peeler, shave lengthwise into ribbons. Peel and mince ginger. Mince garlic. 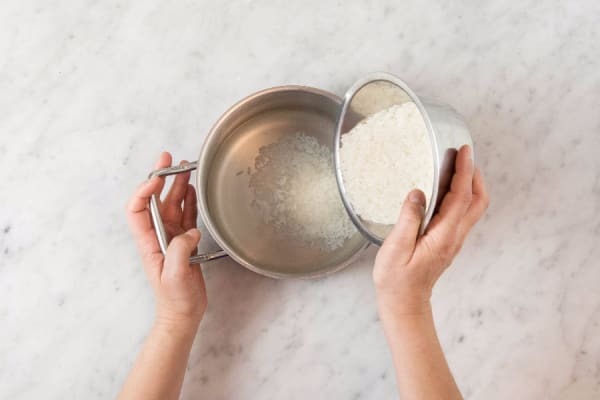 Bring rice and 1¼ cups salted water (2½ cups for 4 servings) to a boil in a small pot. Once boiling, cover and reduce heat to a gentle simmer. Cook until tender, 15-20 minutes. 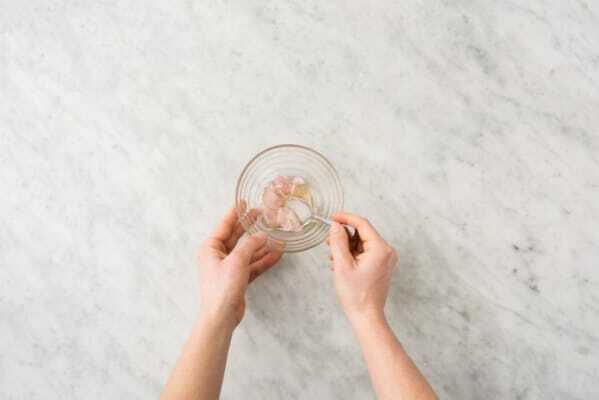 In a small bowl, toss scallion whites with vinegar and a pinch of salt. Set aside to marinate. In another small bowl, combine sesame oil, half the soy sauce, up to half the sriracha, and 1½ TBSP sugar (3 TBSP for 4 servings). Heat a drizzle of oil in a large pan over medium-high heat (use a nonstick pan if you have it). Add carrots; season with salt and pepper. 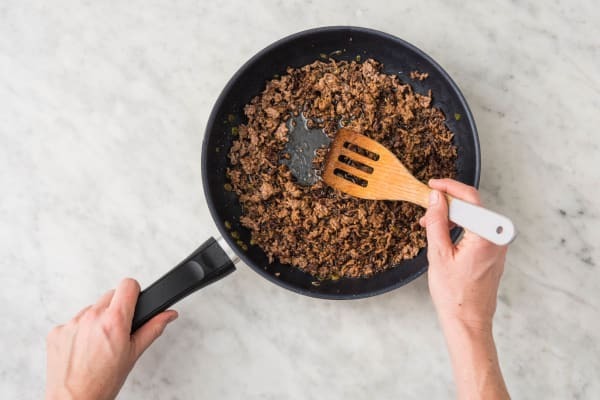 Cook, stirring, until just tender, 3-4 minutes. Transfer to a medium bowl. 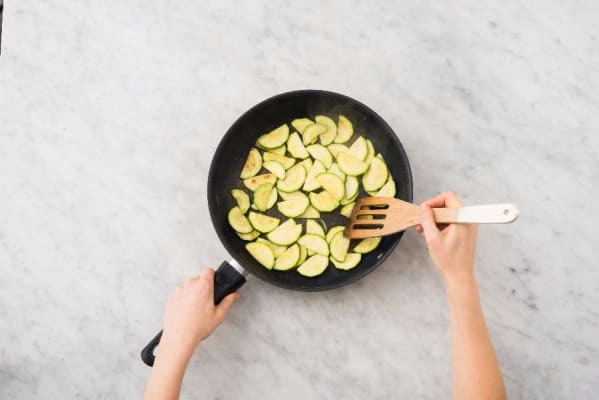 Add zucchini and another drizzle of oil to pan. Cook, stirring, until tender, 4-5 minutes. Transfer to bowl with carrots. Add mushrooms and another drizzle of oil to pan. Cook, stirring, until tender, 3-5 minutes. Season with salt and pepper. Remove from pan and set aside. Heat another drizzle of oil in same pan over medium-high heat. Add garlic and ginger. Cook until fragrant, about 30 seconds. Add beef and cook, breaking up meat into pieces, until lightly browned, about 4 minutes. Drain any excess fat from pan. Increase heat to high and cook until browned, crisp, and cooked through, about 3 minutes. Add remaining soy sauce. Cook until mostly evaporated, 1-2 minutes. Season with salt and pepper. Divide rice between bowls. 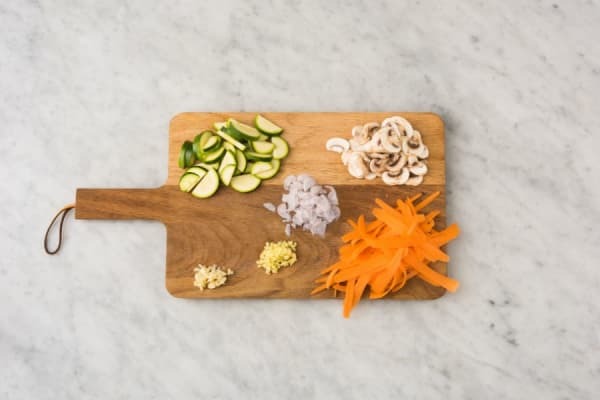 Arrange beef, zucchini, carrots, and mushrooms on top. Top with pickled scallion whites (draining first). Drizzle with sauce and remaining sriracha (to taste). Sprinkle with scallion greens and serve.